One of the fundamental problems of photography not necessarily encountered by any other type of artist is the problem of access: to photograph something, you ordinarily have to be in proximity to it, or in a position to see it, or at least at the proper standpoint—and being there is not always easy or safe. The ultimate example of the exclusivity of access is probably pictures taken on the surface of the moon, but Danny Lyons' insider photographs of a motorcycle gang in The Bikeriders and Larry Clark's documentation of a violent drug subculture in Tulsa are good examples as well—and there are others, of course. (One of my own mentors in photography, the late Steve Szabo, once answered a student's question "What should I photograph?" by asking back, "What can you photograph?") Above every other genre of photography, however, war photography is the one which makes the most demands in return for access. 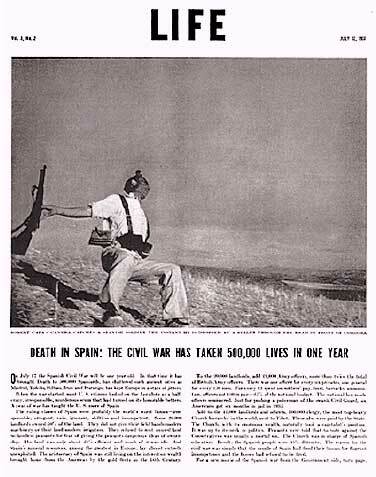 At only 22, Capa was the age of most graduating college seniors when he took this. He lived one of those comet-like lives—bright, and brief, as well as vivid and romantic in the best mid-century movie-star tradition. He was hard-partying, handsome, invariably described as "dashing," a womanizer, a risk-taker—an outsized personality, much loved, eventually much missed. Unlike Henri Cartier-Bresson, with whom he founded the international freelance agency Magnum Photos with their friend Chim (David Seymour), Capa cared little for careful organization or the veneer of art in his photographs. He sought immediacy and authenticity. The novelist John Steinbeck, who knew Capa well from their collaboration in Russia in 1947, said of him, "He could photograph thought...and capture worlds." 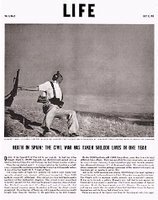 Having already photographed four wars, Capa professed to have given up war photography before he was killed, famously saying that war was like "an actress who is getting old—less and less photogenic, and more and more dangerous." He was in Japan for a Magnum exhibition in 1954 when LIFE called needing a photographer in Indochina. 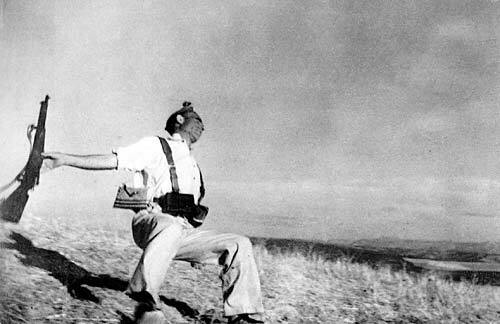 Once there, Capa left the column he was with to go up the road so he could photograph the advance. He stepped on a land mine. When he was reached moments later, his leg blown off and a gaping hole in his chest, he was still alive. He died clutching his camera, one of the very first of 135 photographers killed in the Viet Nam war. He was 39. I "tune in" every week expecting to see something from Kertesz - no show, yet? Still Capa will do for now, and I guess this is about the most iconic; although I think I prefer one from D-Day - but then it's not my Top10! I agree that this is one of the most amazing war photographs because it truly captures the most "decisive moment" possible, the moment of death. Eddie Adams famous photograph of the execution of the Viet Cong soldier shares this chilling quality. 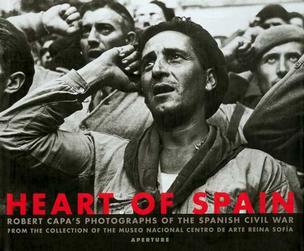 Last year I saw an exhibition of Capa's prints from the Spanish Civil War displayed in Madrid. The photos were wonderful, but seeing them in Madrid added another dimension to the experience. Spain is only now starting to come to terms with the horror of that war. Neighbors killed neighbors. There are many many people who are still unaccounted for, and I have read there are many unmarked graves. It is a trauma that will likely take a few generations to heal. Very interesting article! Through my good friend Joe Galloway who co-wrote "We Were Soldiers Once and Young" I've been privelaged to get to know some of the better photographers of the Vietnam War. I was reminded of the Life magazine photo I had seen of the Buddhist monk, in the early 60's in Vietnam, setting fire to himself. I was only about 9 or 10 years old then, but my family, like so many others of the time, had a subscription to Life. It's been many years since I've seen that photo, but now it comes back to me like yesterday. Some images create that kind of impression on you. Anonymous, which Kertesz picture would you propose as one of the ten greatest ever taken? I wonder whether Capa should be classified as insane, reckless, incredibly brave or just professional. He probably requires all those adjectives and more. 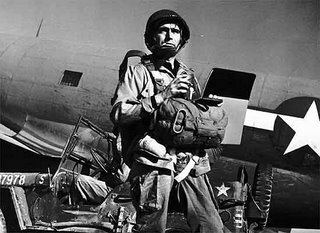 Although D-Day was perhaps a more significant event for humanity, Capa's pictures of the landing are deeply rooted within their historic context, while this one manages to transcend it. I'm not saying context isn't important, but this picture derives its iconic status from something more than mere history -- what could be more fundamental than the meeting-point of life and death, and that too death in conflict? Mike, I was on vacation for a couple of weeks, and it occured to me (while trying fruitlessly to photograph the Tennessee Mountains), that one characteristic of a "Great" Picture is that it is always the one which comes to mind when others in similar genre are considered. For example, any landscape photograph which contains an image of the Moon will be automatically compared in one's mind to AA's "Moonrise." No other picture of Churchill, no matter how good, will ever supplant Karsh's. Any photograph of someone being shot will always be "compared" with this one, including Eddie Adams' one. Any still life of fruit compared with Pepper #30. Etc.